Azita Emami Fifty lives and a significant loss of hope were only part of the toll last week as another white supremacist expressed his opinion through the barrel of a gun, taking innocent lives at a place of worship. The last few years have unfortunately revealed that racism and white supremacy exists across the world…. COMPASSION A Key Nursing Tenet -– Let’s use it! What an amazing 2017-2018 year! 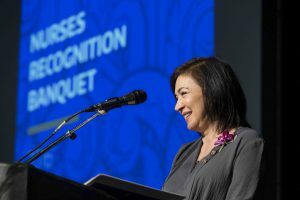 Congratulations to School of Nursing faculty and students! Announcing the No. 1 public School of Nursing! Azita Emami I had hoped to send you a note this evening wishing you a joyous President’s Day weekend. Instead, I find myself writing to you about a horrible tragedy earlier this week: a school shooting in Florida in which at least 17 people were killed. Reports indicate that it is among the worst school shootings in U.S…. Azita Emami During Nurse Legislative Day on Jan. 22, 2018, many legislators engaged with UW School of Nursing students, faculty and advocates, as well as nurses and students across the State of Washington. Many legislators expressed an interest in having nurses’ input about the opioid crisis, and I appreciate the opportunity to amplify those discussions…. Azita Emami January 22nd is Nurse Legislative Day. It is an opportunity for you to invest a small amount of time that will result in benefits for every one of your constituents. Nurse Legislative Day is being coordinated by the Washington State Nurses Association, which has arranged for a meeting with you on that day…. Legislative update: What Should the Minimum Nursing Degree Be? Congratulations on a wonderful Autumn quarter!